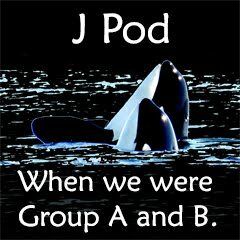 ...here's a sample of what I heard...Js are the loudest, Ks are a bit in the background - their kitten sound - and then a few up-tick L pod calls toward the end. 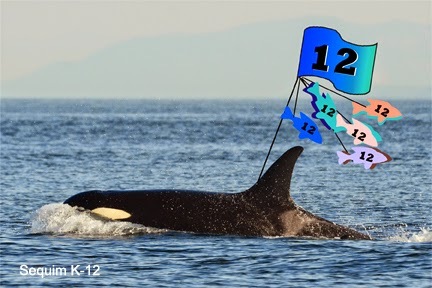 Sequim K-12... just had to get her in on the fun...hanging off the flag are salmon - she doesn't want you to forget about how much they need salmon! 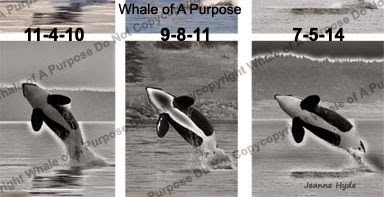 Sequim is the only living whale in the Southern Resident Community with a number 12. 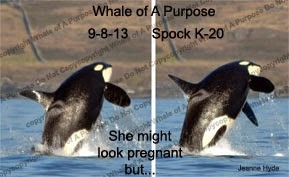 There's a 22 in each of the pods, there is a 42 in two of the pods, there is one 72, 82, and one 92 in one of the pods, but there is only one 12 and she is ready for the big day! 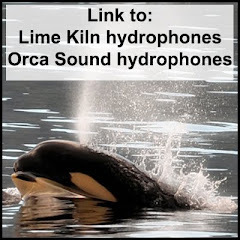 I didn't know they had been seen when I began hearing them, at about 10 a.m., over the Lime Kiln hydrophones. They certainly didn't sound too far away. That evening I learned that at the time I was hearing them they really were very far. 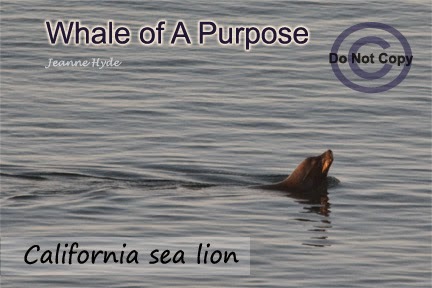 The seas were flat calm and conditions had to be just right for their calls to reach the hydrophones. 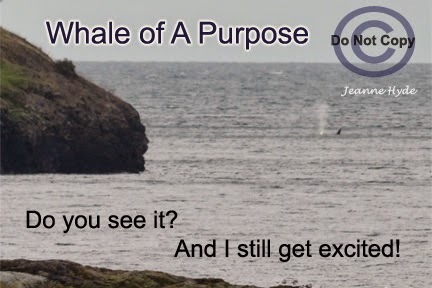 No wonder I couldn't find a whale in all my searching...they were way beyond visual sight! 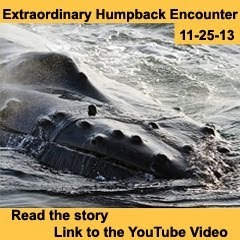 I haven't 'heard' from the whales since that day...and the 'big game' day is often a time when they show up! ...that's all they told us as far as I know! ...I ended up close to the bottom end of the island...now what?...go that last quarter mile or turn around?...just then the phone rang: "Cattle Pass, Cattle Pass" is all I heard. I was already there!...talk about lucky! 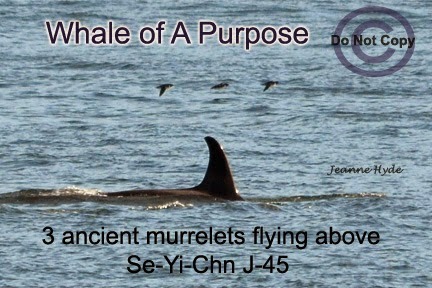 ...Se-Yi-Chn was up with his family the J14s, Granny J-2, Onyx L-87, Shachi J-19, and Eclipse J-41...and lots of birds too! ...after which they grouped up and were taking several minute dives...once out of the pass, which way would they go? If you haven't signed the petition or gotten your friends to, hopefully you will now. 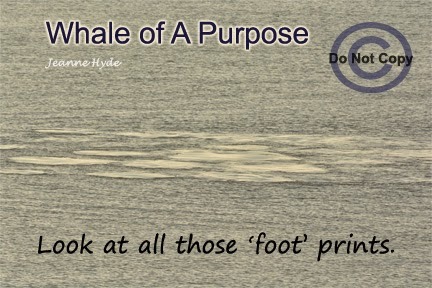 ...a whale! wow!...then another and another...I could tell they were Ts from their behavior...they were taking something to eat! When they are at that corner and then go out of view...down island? or just eating? I chose down island - wrong! 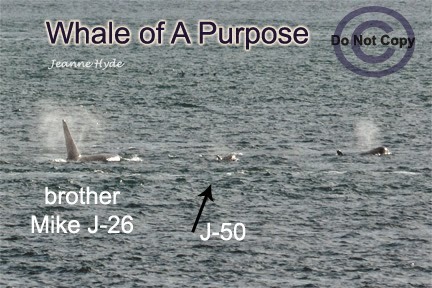 ...I kept track of them, watching what looked like them making another kill, until I left to get on the boat with Dave Ellifrit of the Center for Whale Research...it was the T60s and T2B who travels with them...you can link to the Center for Whale Research encounters page for Dave's write up on the trip. 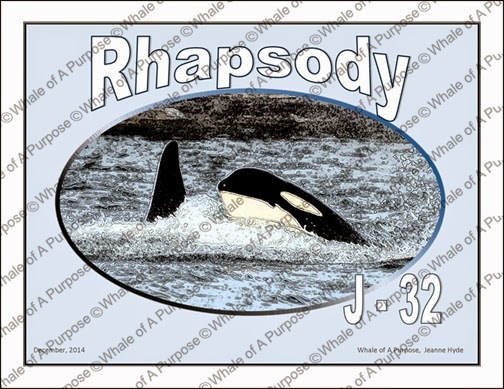 ...back on December 4th I was out on Maya's Westside Charters and we saw the T60s...I never did post about it...it was the day that Rhapsody had died and things just got topsy-turvy. 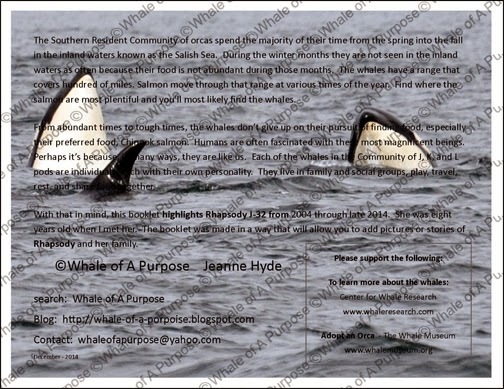 ...I had been recording over Lime Kiln hydrophones...having seen the locations of these whales and having a time stamp on what images I did get from shore, I checked when I got home to see if they had been 'talking'. I didn't expect to find anything and was surprised that I did. I assumed it was the T60s and T2B who were doing the 'talking' but didn't take the time to listen just then. ...Now just who was it who was there? These calls sound more like Residents than Transients...note: these were recorded over 1 1/2 hours so the calls are separated with a slight pause on this clip. 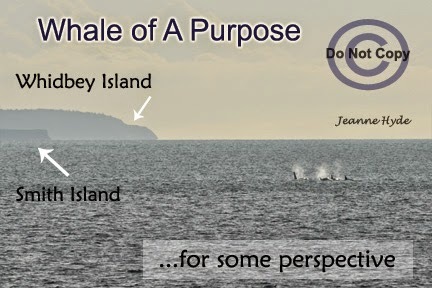 ...did we have have some Residents in the distance and not know it? ...are these just what the T60s and T2B sound like? 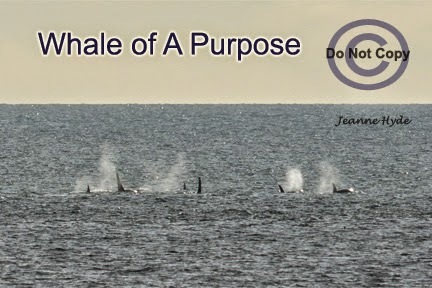 note added 1-19-15: Residents, sounded like K pod whales, but where out there were they? ! 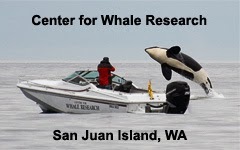 If you haven't signed the petition: Southern Resident Killer Whale Salmon Initiative please do and ask your friends, who know how much you care for these whales, to sign the petition because they know how much you care! 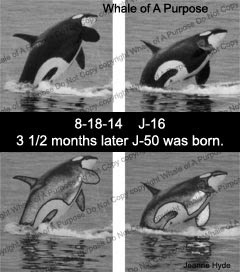 "In just a matter of weeks we’ve collected more than 5,800 signatures on our petition to remove the four lower Snake River dams to save the Southern Resident Killer Whales from extinction! 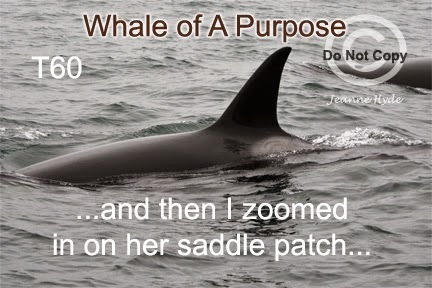 Orca advocates are amazing. We now need to double the number of signatures we have in less than two weeks. The folks who produced DamNation are going to Washington, DC the last week of January, 2015 to screen the film DamNation and to lobby Congress to remove the dams. They want to present our petition. 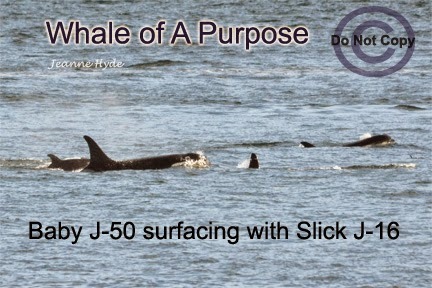 They believe if they can add the importance of dam removal to the Southern Residents' survival and recovery to that of the endangered and threatened salmon runs, it will be a great benefit in moving the discussion towards removing the dams. They believe that if we have at least 10,000 signatures on our petition, it will be a significant help. Please help us help the Southern Residents! If you haven't signed our petition yet, please sign it now. Please circulate the petition as widely as you can. THANK YOU! 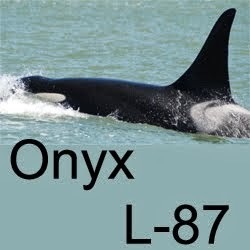 Here is the link, https://www.change.org/p/rick-larsen-stand-with-us-and-support-removing-the-four-lower-snake-river-dams-to-save-the-southern-resident-killer-whales-from-being-dammed-to-extinction." 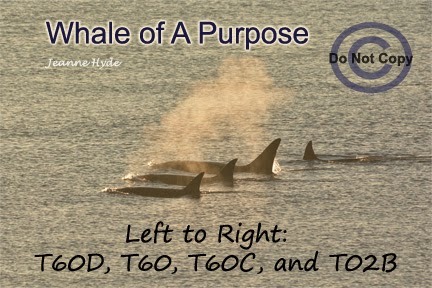 Over the past ten plus years I've gotten to know these whales. Sometimes who they are is easily seen and others, not so. 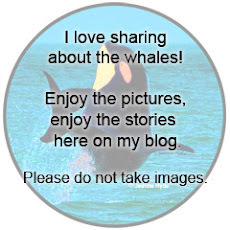 I've blogged about them and what I've seen. Last summer I began to put some of their stories together in short booklets highlighting things about them, through my eyes, as to who they are. 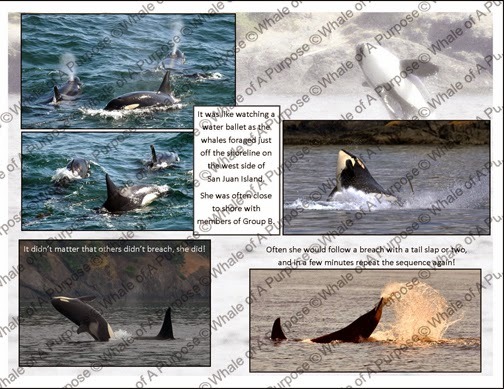 It all began with creating a gift for someone who is an orca adopter. 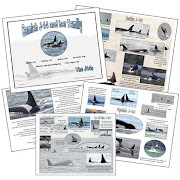 I made two booklets for her, one of Tika K-33 and the other of Cali K-34, her adopted whales. It was so well received that she asked if I would make one for Granny J-2, which I did. And then, Rhapsody's death occurred. Someone else asked me to write about her and who she was. 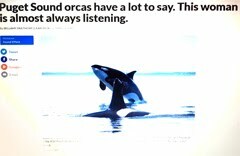 It wasn't easy to find her voice because she was more than just a whale known as 'the breacher', but finally I did. And the way I did was through the process of creating the booklet. 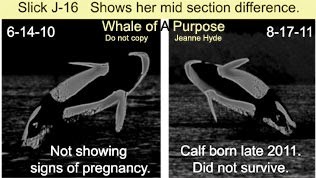 The whales and their stories are intertwined. 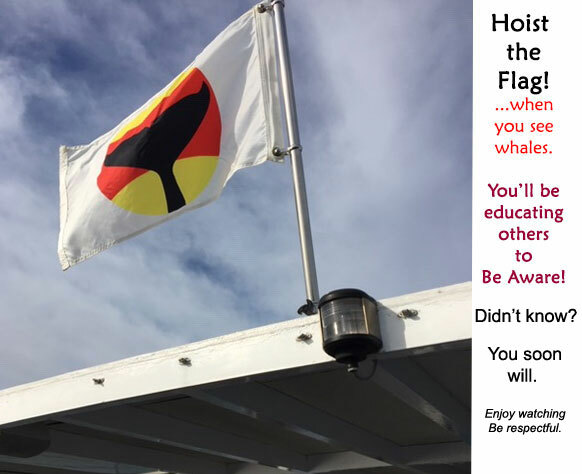 Each booklet, which is 10 to 15 pages, highlights events I have witnessed about that individual, what specific things they have done, and their interactions with others. An example: Granny is the star of her booklet but without the others there would be no story. However, she would be mentioned in others booklets because she participated in their stories. 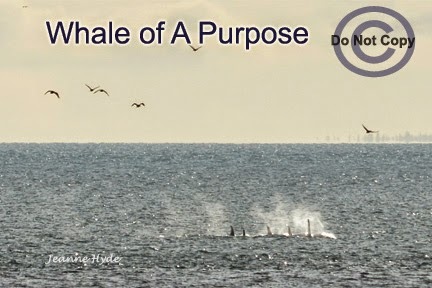 Each whale has something to teach us about them. I've met some as newborns and others when they were already in their late years. Ten years was a good time to do this, Hopefully, in another several years I will be able to add to their stories. 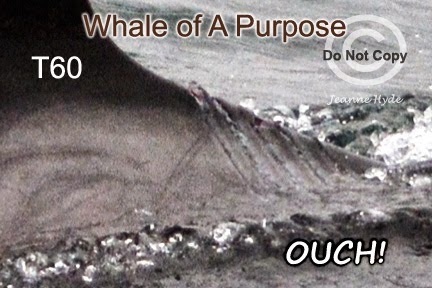 Not all of the whales will have booklets. 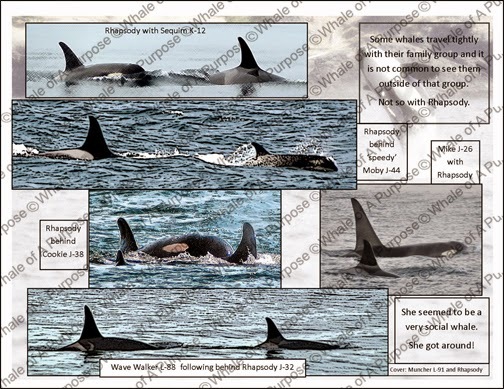 Some booklets will include the entire family group. They are a work in progress right now and take time to create. Each booklet is $12 plus tax in WA and shipping. Shipping costs are about $5 U.S. for one booklet. The total cost would be between $16 and $20 shipped in the U.S., dependent on postal costs. Baba L-26 (deceased) with parts of it about Ballena L-90 and Crewser. Jade L-118 is in progress...some of these have been requested. I'm finding that each booklet takes 40 or more hours to create. 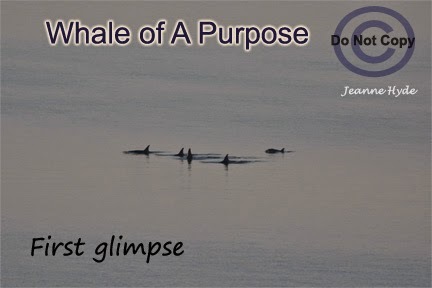 Each is a glimpse into the life of the focused whale. And each one I complete becomes my favorite! 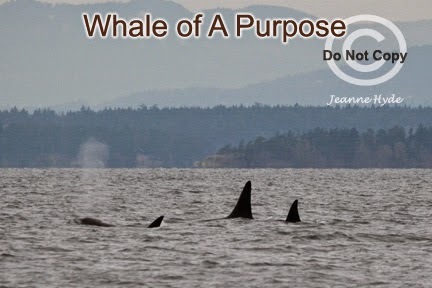 - just like the whales they are all so different. 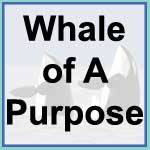 If you want one of a whale that I haven't yet created for, order it and I'll make it up. 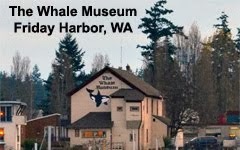 You can order through me or they are also available through The Whale Museum - price is different.